In the voluminous history of American art, one of the most popular chapters recounts the flourishing of our native school of illustration during the late nineteenth and early twentieth centuries. It was an era virtually brought to life by the breath of art, a time when illustrative images of past and present events engendered a spirit of national aesthetic and pictorial identity. Woven inseparably into this fabric was the universal lure of the American West, and at the very heart of that story lay the life and work of W.H.D. Koerner. Koerner’s life (1878 – 1938) spanned the great age of American illustration. Born in Lunden, Schleswog-Holstein, Germany*, Koerner was an infant when his family chose the promise of American soil. He grew up in rural Iowa. Painting cows on milk wagons for $5 each in his hometown of Clinton provided his entry into the professional world of art. As with many aspiring artists of his time, Koerner decided on a career as an illustrator. His success in that pursuit followed a natural course of formal training, apprenticeship, and good fortune. By age 20, he had garnered a job in the Art Department of the Chicago Tribune. In his six years there, he learned enough to realize that further study was necessary and so, when he departed, he headed for New York City and George Bridgman’s life class at the Art Student’s League. He also studied independently under Gutzon Borglum and, later, Howard Pyle. Harvey Dunn, N.C. Wyeth, and Frank Schoonover learned side by side with him. Koerner’s early style of painting owes much to Pyle’s tutelage in which heroic figures, warm hues, and precise but bold brushwork were predominant elements. 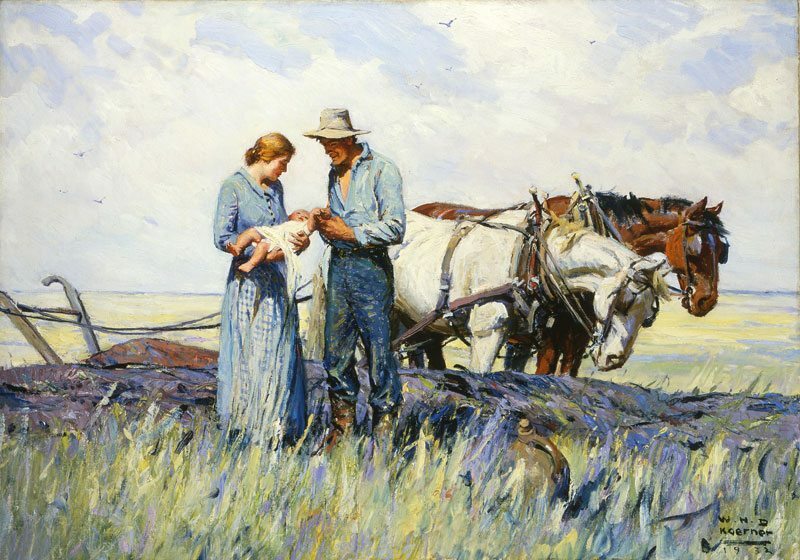 In the 1920s, under the influence of American Impressionist Hugh Henry Breckenridge, Koerner’s art underwent change. His palette brightened, his drawing became more spontaneous, and he began to juxtapose rather than blend colors, producing new vibrancy in his work. Koerner is best known for his long and fruitful association with the Saturday Evening Post. His first assignment came in 1909 and he worked with them for most of his remaining life. 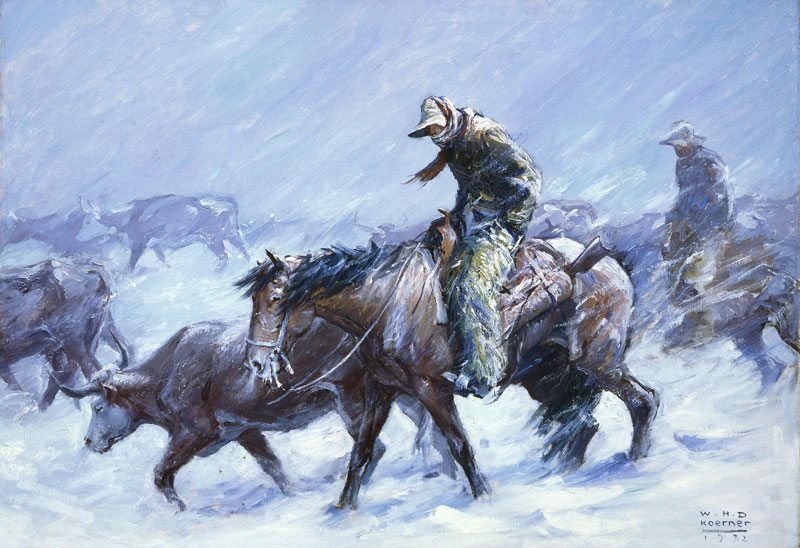 Devoted primarily to western scene, Koerner’s illustration and covers set a public standard for historic perspective and artistic excellence. A full generation of American readers owe their vision of the Old West to that great artist. Koerner died in 1938 at his home in Interlaken, New Jersey. His studio, overflowing with the symbols, props, and icons of the artist’s West, was maintained by his widow until 1964, and then passed on to their children.